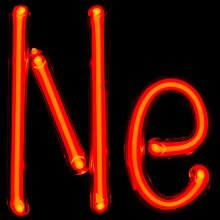 Neon is a noble gas. It is chemical element 10 on the periodic table. Its symbol is Ne. The word "neon" comes from the Greek word meaning "new". It was discovered by William Ramsay and Morris W. Travers in 1898. Neon does not react with other elements, so it is found by itself. There is not much neon in the air, and it is clear, so we do not see it. Neon gas is used in gas discharge lamps. When electricity goes through the neon, it lights up red. Due to this quality, it is used in signs. Similar signs use other gases to make other colors, but they are also often called "neon signs". Neon is also a term referring to a type of color that is very bright, such as lime green. No true chemical compounds including the neutral compounds of neon are known. Where there is the helium compound HHeF, which might be stable, the analogous compound with Neon is not. ↑ Hammond, C. R. (2000). The Elements, in Handbook of Chemistry and Physics 81st edition (PDF). CRC press. p. 19. ISBN 0849304814. ↑ Preston-Thomas, H. (1990). "The International Temperature Scale of 1990 (ITS-90)". Metrologia 27: 3–10. doi:10.1088/0026-1394/27/1/002. http://www.bipm.org/en/publications/its-90.html. ↑ Ramsay, William; Travers, Morris W. (1898). "On the Companions of Argon". Proceedings of the Royal Society of London 63 (1): 437–440. doi:10.1098/rspl.1898.0057. ↑ "Neon: History". Softciências. Retrieved 2007-02-27. This page was last changed on 14 January 2019, at 18:56.